Edit: I have now also posted this bug on meta.SE. I don't know whether this question ought to be deleted. Edit again: Apparently it has already been posted, both on main meta and on stackoverflow meta. The comment editing functionality recently underwent a cosmetic change. When pressing the "edit" button, instead of (at least seemingly) replacing the original comment with a text box for editing, it now makes the text box appear below the comment. It felt strange at first, but I've since grown accustomed to it. I don't know why such a change was needed, but it's fine, and that's not what this post is about. This post is about the fact that the "edit" button doesn't disappear after you click it and the textbox appears. And it doesn't stop functioning either. Thus you can open multiple text boxes. I cannot imagine that this is intended design. Below is a picture of what happened after pressing the "edit" button on the comment below four times. 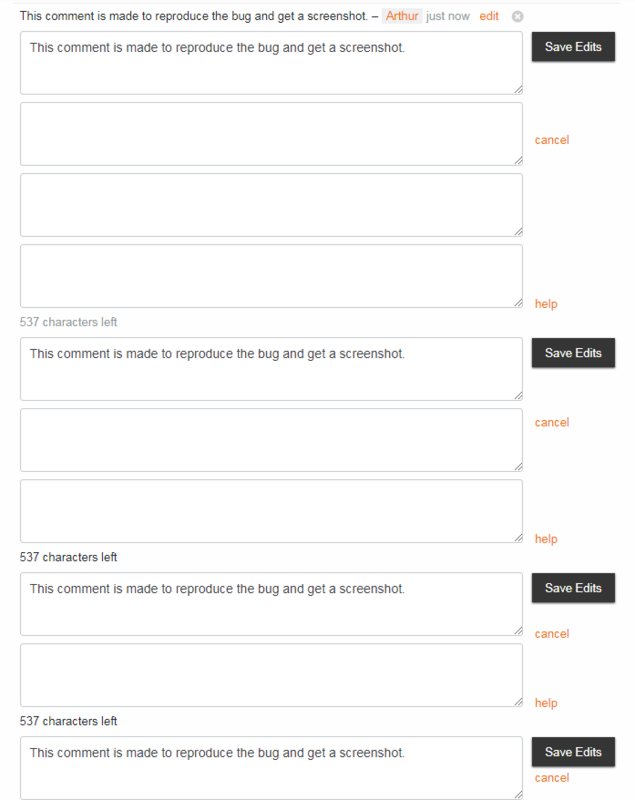 I have tried, on my first comment below, to edit the comment using one of the other boxes (one of the ones with the comment text already placed in it and with a "Save Edits" button next to it). The comment stayed unedited. As far as I can tell, pressing any of the "Save Edit" buttons or "cancel" buttons will close all the boxes. In case this is browser dependent, I am on Chrome Version 68.0.3440.84, on Windows 7. Browse other questions tagged bug comment editing .